1- Zuo Ci can choose any player to recover one. 2- Zuo Ci can choose a player within the target's attack range. They then lose one health. When Zuo Ci is targeted by a non delay tool card, he can do a judgment. If it is a club, the tool does not work to him. If it is a heart, Zuo Ci can redirect to anyone else. 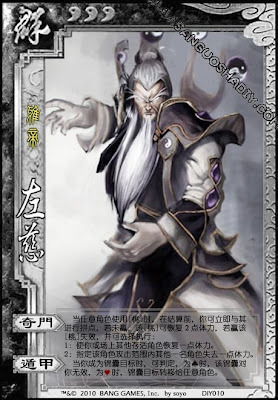 If Zou Ci redirects a card such as Barbarians, the lucky player he selects will have to play an Attack for himself and then an Attack for the turn given to them by Zuo Ci.